The Ayacucho Mission is an annual health campaign serving the community of Ayacucho, Peru high in the Andes Mountains. Every year, our team of volunteers travels to Peru for a two-week campaign, delivering free medical, surgical, mental health and preventive care to thousands of impoverished, indigenous persons in Ayacucho City and in mobile clinics traveling to surrounding villages. We collaborate with local health care providers and nonprofit organizations, and provide monetary support and expertise to maintain numerous year-round projects and services in this community and in other places with great need. Finally, the Ayacucho Mission creates opportunities for health professionals, students and other volunteers experience the transformative influence of international service and collaboration with the goal to foster an enduring spirit of altruism and engagement in our volunteers. What exactly do physicians, nurses, pharmacists, translators and other volunteers do on the Ayacucho Mission to make a difference? Get a glimpse of the experiences of volunteers, from their own perspective. Interested to learn how you can contribute as a volunteer or supporter? Click 'Get Involved' to join the mailing list, donate to the mission, or learn about the application process. On the majority of days, volunteers and physicians load up vans early in the morning to travel up to two hours to Tambo, Quinua and other nearby villages. In collaboration with local residents and professionals, we establish temporary mobile clinics in the small health centers and outposts of these communities with very limited access to physicians. The line of patients often extends outside the building, as locals try to be seen by physicians of numerous specialties, including: family medicine, cardiology, obstetrics and gynecology, orthopedics,and psychiatry. Another component of the mobile clinic is its mobile pharmacy. Volunteers work with a skilled pharmacist to dispense medications and vitamins prescribed by mission physicians, and educate patients about their regimens. The pharmacy also provides eye glasses, eye and ear drops, over-the-counter medications, toothbrushes, and toys for local children who have helped with translation in the past. Our mobile clinic in Tambo features a mental health clinic, each year comprised of psychiatrists, social workers and translators. Prolonged political violence has led to widespread mental health issues, including PTSD, for which there are very few local options for treatment. Our psychiatrists provide brief counseling and referrals to COSMA, a year round mental health service organization our mission helps support. In the regional hospital of Ayacucho, a surgical team sets up a surgical care unit. The team includes orthopedic surgeons, OB-GYN surgeons, plastic surgeons, and general surgeons. Medical students help facilitate patient movement, and mission nurses and physicians care for the patients pre and post operation--culminating in a hand-off to a local physician for follow-up care. We identify a number of our surgical patients from our mobile clinics, and support the cost of transportation and lodging for the patients and a family member. In Ayacucho, Tambo, and surrounding communities volunteers promote oral health through school outreach. Classes are individually visited in each local elementary and middle school, providing fluoride treatment to many hundreds of students each year, and discussing the importance of oral hygiene. Within the surgical care unit is the plastic surgery team. Each day, surgeons perform multiple cleft lip and cleft palate operations. Patients range from infants to teenagers, often flown in for surgery from other areas of Peru. 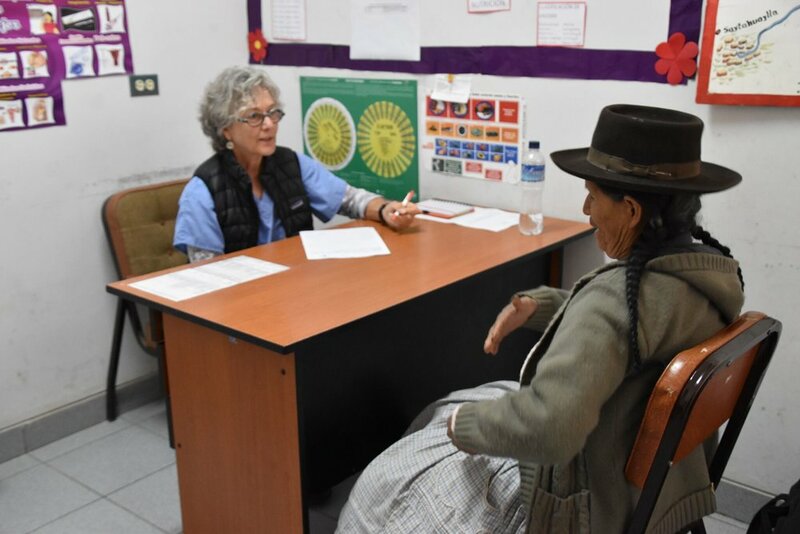 After discovering surprisingly high prevalence of type 2 diabetes through a several year screening program, the Ayacucho Mission now supports a collaborative, year-round diabetes program run by a local registered nurse with support of Ayacucho physicians. The Mission provides medications, testing supplies and provider education to support the program which serves dozens of diabetes patients throughout the entire year. The Ayacucho Mission has joined hands with Wasi Esperanza Rehabilitation Center, which provides rehabilitation, including physical therapy, occupational therapy to dozens of children with physical and developmental disabilities such as Down syndrome and cerebral palsy. The Ayacucho Mission is helping sponsor a special education program for many of the children at Wasi who cannot access typical schools to ensure they continue to meet educational goals. Our pediatricians, cardiologists and orthopedic surgeons provide medical consults to dozens of children at the center, while volunteers visit to share gifts and playtime with the children. Mission volunteers visit the Puericulturio (Orphanage) Andres Vivanco Amorin, which is the home to 80 children from Ayacucho. Each year, the Mission provides medical attention to the children, funding to support their programs, toys and gifts sent from Mission supporters and wonderful recreational activities including field trips, horseback riding, soccer games and musical performances. Our Mission accomplishes the following: a) provides medical care to an impoverished population; b) provides equipment, materials, and supplies to improve the medical system; c) provides psychiatric evaluation, treatment and rehabilitation to the mentally ill population; d) provides state of the art medical management to specific high risk patients as diabetics; e) provides assistance to local orphanage; f) provides dental services (a joint participation with the Peruvian American Dental Association (PADA); g) shares knowledge and organizational skills to allow the transition to a self-supporting regional hospital; h) fosters growing appreciation of the kindheartedness of our international volunteers; and i) fosters love and respect for Peru and Peruvians.